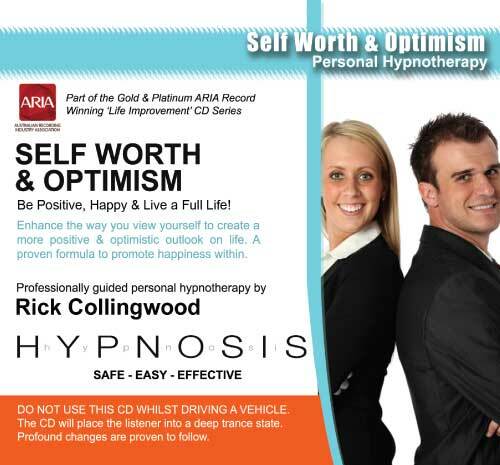 Helps create a more optimistic outlook on life by improving your sense of self worth & positivity levels. Free yourself from negativity and self defeating patterns to create a brighter future. Automatically become a more positive person to always view the glass as a half full rather then half empty. This CD program will allow you to create more positive opportunities in your life and to also allow you become more happier about who you are and where you fit in. It will help you to view the world, and more importantly your own place in the world, with a more optimistic attitude. It is useful to boost your self esteem and to also increase your own sense of self worth. For these reasons, we recommend using the Self Worth & Optimism program or the Happiness & Self Esteem program to assist with all other CD titles on this site. This is because these 2 titles both are designed to implement a positive personal platform of self respect, love and a subsequent willingness to take the first step to changing other areas of one's life.